Daredevil Season Three is arriving on a wave of fan hype, and with good reason. The highly anticipated new season brings back a fan-favorite villain in Vincent D'Onofrio's Wilson Fisk and also introduces a long-awaited villain to the Marvel Cinematic Universe: Daredevil's nemesis, Bullseye. So, is the new season worth the hype? We're happy to report that it absolutely is, and then some. Season Three picks up after the events of The Defenders, and quickly reveals how, exactly, Matt Murdock (Charlie Cox) went from the bowels of a collapsing building to the care of the nuns that raised him, including the tough-love guidance of Sister Maggie (Joanne Whalley). Matt may have survived his war against The Hand, but he's not fully intact, as his unique perceptive abilities now come with a severe weakness. Regardless, Matt feels a burning desire to leave the life of "Matt Murdock" behind and fully become "Daredevil" in order to end the main conflict in his life. The small battles to reclaim his vigilante mantle as "The Devil of Hell's Kitchen" begin to attract attention -- namely his friends Foggy Nelson (Elden Henson) and Karen Page (Deborah Ann Woll), who have conflicting opinions about whether Matt is truly gone. Murdock's existential dilemma quickly gets sidetracked once Wilson Fisk (Vincent D'Onofrio) manages to strike a deal that springs him from prison. 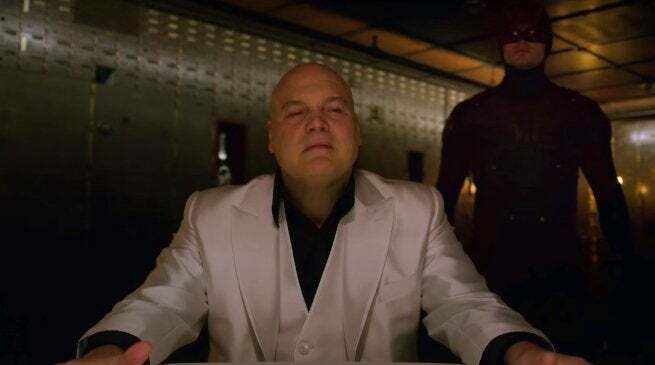 Even though he's still on a government leash, Fisk begins a scheme with two clear goals: getting back his empire and its queen, and making life hell for both Matt Murdock and Daredevil. That plan goes from vengeful wish to genuine possibility once The Kingpin meets an FBI Agent named "Dex" (Wilson Bethel), a man with questionable morals and a unique marksman skill that rivals Daredevil's enhanced abilities. Daredevil Season Three is a true culmination of what came before, tying off a lot of threads while still telling its own focused and self-contained story. It's a season and storyline that both feels deeper and more sophisticated in its narrative and themes, yet is still full of hard-hitting action, big twists, and edge-of-your-seat thrills. It also has some of the most well-measured character drama of any Marvel Netflix show, making even subplots feel both important and necessary. New showrunner Erik Oleson steps in with a clear agenda to get over the usual Marvel Netflix hurdles, which include clunky side stories and characters, uninspired repetition of ideas and sequences like hallway fights, and momentum that ramps up early on only to lose steam in the back half. Oleson makes it a mission to be more successful on all three fronts than a lot of his predecessors -- and to his credit, he largely pulls it off. Side stories like Karen and Foggy, or Matt and Sister Maggie, have renewed weight and importance, and nothing feels extraneous. Every character, every scene, feels like it's contributing to a larger whole, and by the end of the sixth episode, we have a clear sense that this is all building to what will be an epic and deeply harrowing final arc in the back half of the season. It should be no surprise that Vincent D'Onofrio is once again a powerhouse of menace and intrigue as Wilson Fisk, in a deliciously plotted story that carefully progresses Fisk from man behind bars to his full-fledged emergence as the Kingpin of Crime. However, the real pivotal part of Season Three is the building of this MCU version of Daredevil nemesis Bullseye, and thankfully actor Wilson Bethel nails the role impeccably. His arc is a slow-burn descent into Marvel villainy, much like Fisk in the first season; this version of Bullseye functions almost like a slasher-horror killer, and Bethel makes each scene of the character's violent spiral into a standout moment even when he isn't using his pinpoint accuracy abilities in horrific ways, which he definitely does. Usually with any Marvel Netflix show, there's a lot to discuss in this section, but not when it comes to Daredevil Season Three. As stated, there's something almost operatic or Shakespearean about the tale that showrunner Erik Oleson is weaving together, and every component (characters, settings, scenes, plot developments) feels carefully positioned and purposeful. There's still potential room in the back half of the season for plot threads to drag, or characters to wear out their welcome, but through the first six episodes, Daredevil's new season earns the trust that it will nail the landing to become one of the best Marvel Netflix chapters yet. Daredevil Season Three premieres on October 19th, only on Netflix.